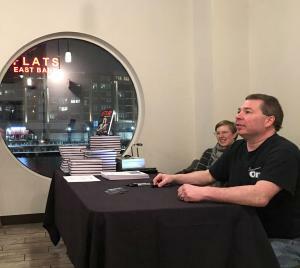 CLEVELAND, OHIO – What could have been a simple author appearance was really three events in one, when author, Joe Milliken, appeared at the Music Box Supper Club on Jan. 12 to celebrate the release of his book. 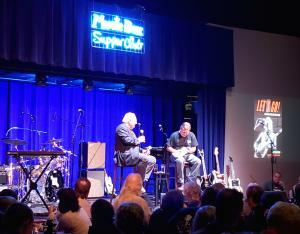 A signing, panel discussion and concert were held, making the night a party for the author and fans alike. A steady stream of fans brought their books and stories to Milliken, author of Let’s Go! Benjamin Orr and The Cars (Rowman & Littlefield, 2018). 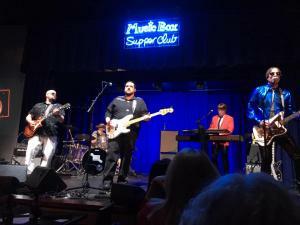 A packed house filled the upstairs room of the club in Cleveland’s Flats East Bank, a once industrial area turned entertainment and dining district. It was an appropriate venue for Milliken, whose book stands as a definitive biography of the Cars bassist. Born Ben Orzechowski, Orr was an integral part of the band that would sell more than 30 million albums and record 15 top 40 hits. He was born in the inner-ring suburb of Lakewood and grew up in Parma Heights, just outside of Cleveland. While The Cars are widely associated with Boston, it was the Midwest where band members formed early relationships. Milliken’s 120-plus interviews and research shape the story of a man who never, ever forgot where he came from. Cleveland is a parochial and proud city, and people here don’t forget their own. And that made this book signing that much more special. After Milliken signed books for dozens of fans, music executive David Spero and Milliken spoke about the book, Orr’s early bands, and the exhaustive research that went into creating the biography. Spero also wrote the book foreword. Spero was a fine choice to host and moderate the on-stage discussion. He is a longtime manager and producer whose father produced Upbeat, a music show on television in Cleveland in the 1960s. Spero got to know Orr when both were young; one of Orr’s early bands, The Grasshoppers,” played on the show (as well as at Spero’s bar mitzvah). The only criticism of the night: The panel discussion and Q and A could have gone on longer. Fans were never restless, soaking in the stories about a favorite son. They cheered and laughed just two miles from the Rock & Roll Hall of Fame, where The Cars were inducted in 2018, an event Milliken also attended. Milliken explained how the book evolved, blossoming from an idea more than a decade ago, to the countless hours of research and conducting interviews. Several subjects early on were hesitant to talk, but Milliken persisted and, over time, began to stitch together a portrayal of who Ben Orr was and what he meant to Cleveland. A poignant moment came when he asked anyone in the audience to stand if they had ever played with Orr. At least a half-dozen rose from their chairs and bars tools. After the discussion, The Cars tribute band Moving in Stereo played as Milliken went back to signing books. The band’s name comes from a song on their iconic, 1978 debut album. The band covered an array of Cars' tunes off several albums, including “Let’s Go,” “Shake It Up,” “You’re All I’ve Got Tonight” and “Gimme Some Slack,” among others. Cleveland draws dozens of regional and nationally based authors every year to speak-and-sign events, with extensive library systems stretching across several counties, independent bookstores and other venues. This one stood out, though, offering an energetic and unique presentation in just the right setting.